About 40 to 50 million years ago, India began to collide with Eurasia and over time this collision has created one of the most prominent mountain ranges in the world. The Himalaya Mountain Range includes eight of the ten highest peaks in the world, including the iconic Mount Everest. Nepal contains the Himalaya Range and Kathmandu, its capital and largest city, is a gateway for hikers and climbers who want to circumnavigate or reach the peak of Mount Everest. The Main Himalayan Thrust (MHT) fault runs parallel with the mountain range across Nepal at depth and is the primary source of small to large earthquakes. There have been many damaging earthquakes in Nepal and the country faces significant seismic risk from this active plate collision. In addition to the seismic risk, Kathmandu sits in a sedimentary basin (i.e., softer and looser rock created by river and lake processes) surrounded by metamorphic rocks (i.e. harder and denser rocks). Previous research in other cities that sit in sedimentary basins near major faults (e.g. Los Angeles and Mexico City) have shown that seismic waves will reverberate back and forth in these sedimentary basins in a process called basin resonance. The basin resonance causes more shaking over a longer period of time and can potentially cause more damage. Although Nepal faces significant seismic risks there are few instruments on the ground to observe and monitor earthquakes and related hazards. Fortunately a geodetic network in Nepal combined with an accelerometer and satellite-based synthetic aperture radar data captured the deformation associated with the 25 April 2015 moment magnitude 7.8 Gorkha earthquake and the aftershocks. In particular the high rate continuous GPS data recorded for the first time a major rupture right beneath a geodetic network and provides unprecedented earthquake information for research and risk resiliency. The observations show that the fault slipped to the southeast over a width of about 20 kilometers and at a depth of between 10 to 20 kilometers. The rupture moved quickly and simply from its starting point near Gorkha toward Kathmandu and continuing to Sindhupalchowk. GPS station KKN4 on the bedrock rim of the Kathmandu Valley shows a simple and smooth pulse of displacement for less than 10 seconds. 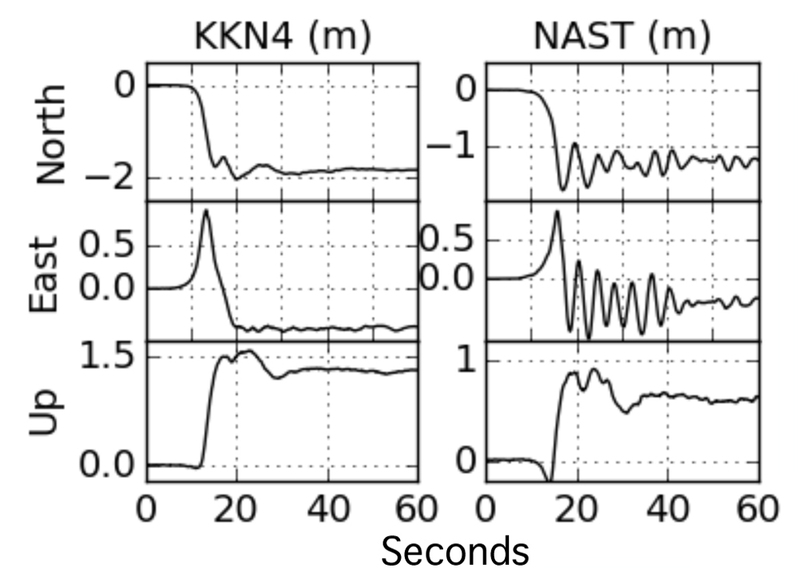 GPS station NAST within the sediment filled Kathmandu Valley shows not only the same slip pulse as seen in KKN4, but also the extended shaking caused by the seismic waves bouncing back and forth within the sedimentary basin. The low-frequency shaking and basin resonance contributed to the collapse of tall structures in Kathmandu. Regrettably more than 8,900 lives were lost in the Gorkha earthquake. More can be done to improve earthquake preparedness and response. 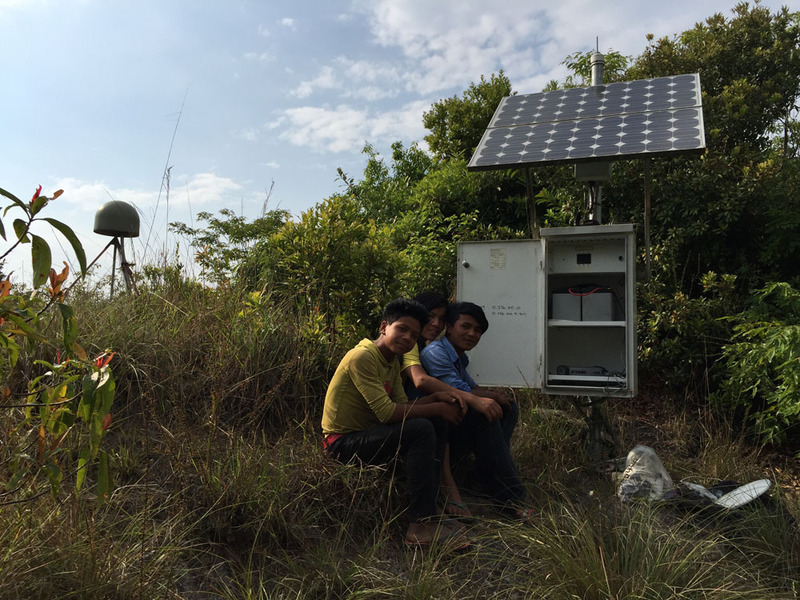 Upgrades and maintenance of the geodetic network will help to provide the observations needed to understand earthquake processes and inform risk resilience. 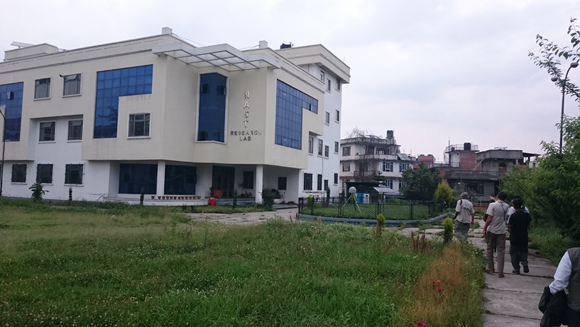 Only one percent of buildings were damaged in Kathmandu due to the Gorkha earthquake, which can be attributed to better building practices and a better understanding of the regional tectonics and local geology. 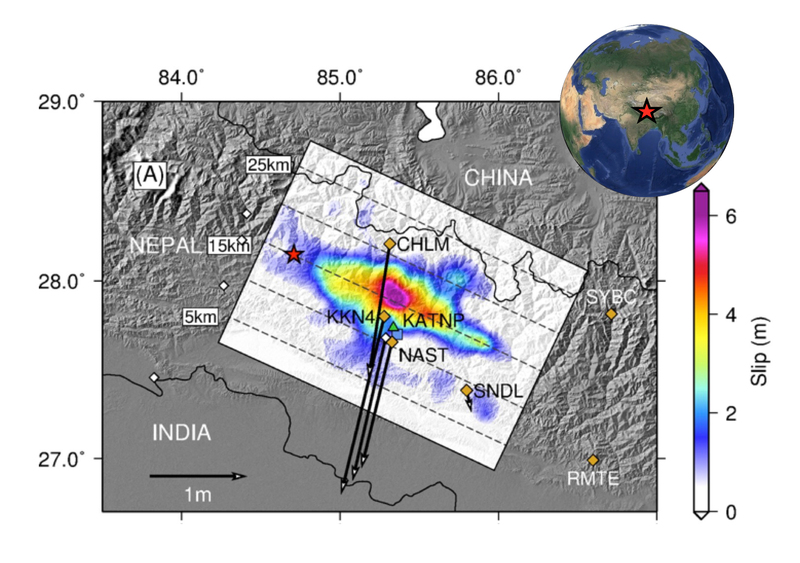 Slip pulse and resonance of the Kathmandu basin during the 2015 Gorkha earthquake, Nepal, J. Galetzka, D. Melgar, J. F. Genrich, J. Geng, S. Owen, E. O. Lindsey, X. Xu, Y. Bock, J.-P. Avouac, L. B. Adhikari, B. N. Upreti, B. Pratt-Sitaula, T. N. Bhattarai, B. P. Sitaula, A. Moore, K. W. Hudnut, W. Szeliga, J. Normandeau, M. Fend, M. Flouzat, L. Bollinger, P. Shrestha, B. Koirala, U. Gautam, M. Bhatterai,. R. Gupta, T. Kandel, C. Timsina, S. N. Sapkota, S. Rajaure and N. Maharjan, Science 349 (6252), 1091-1095. doi:10.1126/science.aac6383.